The fuel gauge is in the top right of the clocks and is the default display when the bike is switched on. 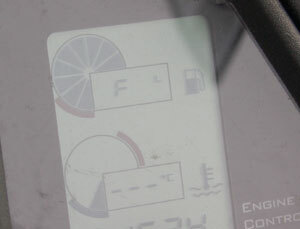 Use the MODE button to cycle between fuel readout and ambient air temperature. It reads in gallons on US and UK bikes and in litres on European bikes. Total capacity is 21 litres, with five in reserve, which is when the light comes on. There’s enough in reserve for 40-odd miles at a push and with a gentle throttle hand. The gauge is about as accurate as those on most bikes (i.e. not very) but is pretty much on the ball with 12 litres or less left and the reserve light can be trusted. Easy, this. When you switch the ignition on, the default is fuel level display. Just press and release the Mode key to switch to air temp readout, and press it again to return to fuel level display.